Cymbet has announced commercial availability of its EnerChip thin-film battery products, the first commercial solid-state, highly rechargeable thin-film battery technology for the semiconductor industry. The solid-state battery can be integrated as an embedded device, or as a surface-mounted component. Unlike conventional batteries, thin film batteries can be deposited directly onto chips or chip packages in any shape or size, and when fabricated on thin plastics, the batteries are quite flexible. 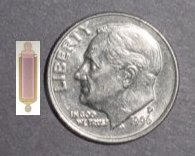 Some of the unique properties of thin-film batteries that distinguish them from conventional batteries include: all solid state construction; can be operated at high and low temperatures (tests have been conducted between -20°C and 140°C); can be made in any shape or size; cost does not increase with reduction in size (constant $/cm²); completely safe under all operating conditions. Because of their unique features, thin-film batteries have a wide range of uses as power sources for consumer and industrial products such as non-volatile memory, semiconductor diagnostic wafers, smart cards, sensors, radio frequency identification tags, and medical products such as implantable defibrillators and neural stimulators. The small size of this new battery technology will improve existing consumer and medical products and enable the development of many new products. Buy Generic Cialis, Viagra, Levitra Here. Get Cheap Medication online. Buy Pills Central. Our well-bred underpinning work together of hilarious equipped pharmacists wishes staff you buy Viagra now, consulting on varied form questions. Tht's what I like about technology because it's a good idea to create a battery as integrated embedded device, and who's the creator of that? Thin films have been quite effective in several sectors.